Atlanta Falcons receiver Calvin Ridley celebrates his second of three touchdown catches in Sunday's game against the New Orleans Saints. FLOWERY BRANCH, Ga. — Opposing coaches have a new reason to reconsider making Calvin Ridley the third priority in defensive plans against the Atlanta Falcons' passing game. The New Orleans Saints tried that approach last weekend, devoting extra defensive help to both Julio Jones and Mohamed Sanu while leaving Ridley in man-to-man coverage. 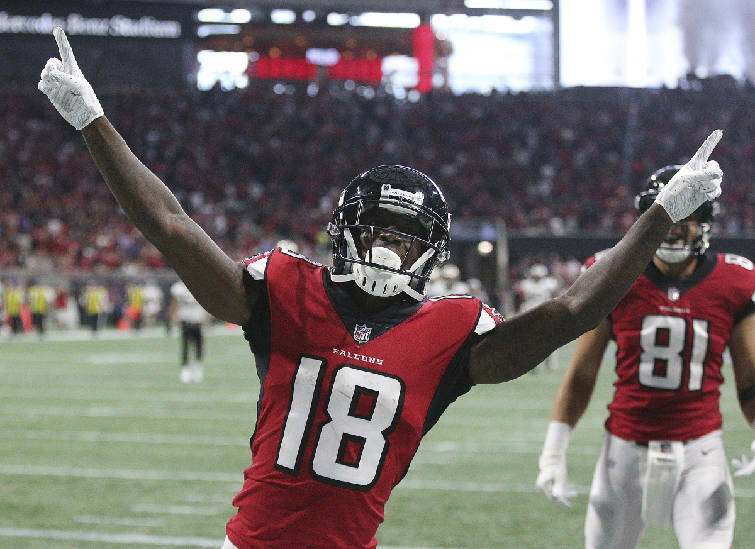 Ridley took advantage of the situation and made three touchdown catches, breaking the franchise's rookie record, although the Falcons lost 43-37 in overtime to fall to 1-2 overall and 1-1 in the NFC South. Ridley's breakout game could pay off for Jones, Sanu and the rest of the offense in future games, including when Cincinnati (2-1) visits Sunday. It could be more difficult for opponents to devote extra coverage to the Falcons' veteran receivers when there is compelling evidence of Ridley's speed and big-play ability shredding a defense. "It will help out a lot," Sanu said. "Calvin is explosive, as you saw on Sunday. He's definitely a game changer for us." In all, Ridley had seven catches for 146 yards against New Orleans, and his three touchdown catches matched Jones' total for the 2017 season. Factor in Ridley's touchdown catch the week before in a win against the Carolina Panthers, and Ridley certainly appears to be another top target for quarterback Matt Ryan. "He creates unbelievable separation," Ryan said. "His acceleration out of cuts is really good. His patience for a young receiver versus man-to-man coverage, knowing how to win and the timing of the play — all of that stuff usually takes a long time to learn, and he's been doing it naturally." Ridley's first time touching the ball against the Saints came at tailback, where he was stopped after taking a pitch from Ryan. His impact at receiver made that gadget play easy to forget. Ridley said he doesn't know if his big game will lead to more attention from the Bengals' defense. Falcons coach Dan Quinn was careful to point out Jones helped to create the scoring opportunities for Ridley in Atlanta's partnership of former University of Alabama receivers and first-round draft picks. Jones was taken sixth overall in 2011, while Ridley was drafted 26th this past spring. "Usually when you open the book, you're staring at 11," Quinn said of opposing defensive coordinators' worries about Jones, a two-time All-Pro first-team selection. "He's the one who gets your attention right off the bat to say 'OK, how is this man not going to wreck the game?'" Another former Crimson Tide star, Cincinnati cornerback Dre Kirkpatrick, is expected to shadow Jones on Sunday. The offense may have to carry a bigger load as the Falcons attempt to replace three injured starters on defense. Safety Ricardo Allen was placed on season-ending injured reserve Tuesday with a torn Achilles' tendon sustained against the Saints. Strong safety Keanu Neal (knee) already was out for the year, and linebacker Deion Jones (foot) also is on injured reserve and must miss at least eight games.